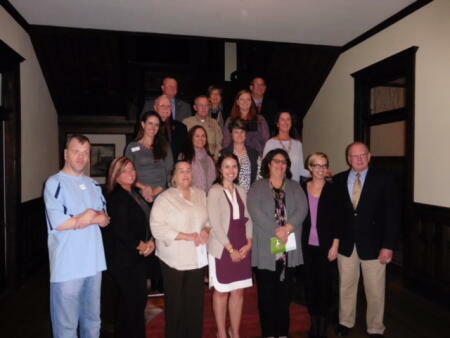 The Harnett County Community Foundation (HCCF) held their annual grants reception Thursday at the historic Howard House, a past grant recipient of the HCCF. $8,750 in local grants were awarded to nonprofits serving the community. Representatives from the Harnett County Veterans Treatment Court, Harnett Animal Welfare Coalition, Girl Scouts - NC Coastal Pines, Specialist Olympics of North Carolina, Erwin Historical Society and CareNet Counseling Central Region attended the ceremony. Hoover Adams was posthumously awarded Citizen of the Year. The award was accepted on his behalf by his wife and children. HCCF President Mary Ellen Lauder presented the grant awards and immediate past president of the HCCF Dale Snipes and Dunn Mayor Oscar Harris presented the Citizen of the Year Award.